Picture a hiring manager. His name's Kevin. He's got 200 cover letters on his desk. He can tell a lot about an applicant by glancing at each one. If your cover letter is too short, he'll think you don't care. But it's the reason it's the right length that lands the interview. The ideal length of a cover letter to land the interview. How to make the right cover letter length by putting in exactly the right things. How long should email cover letters be? How to make it through both phases of the cover letter reading process. Here's a good cover letter example made with our fast online cover letter tool. Want to write your letter in 15 minutes? 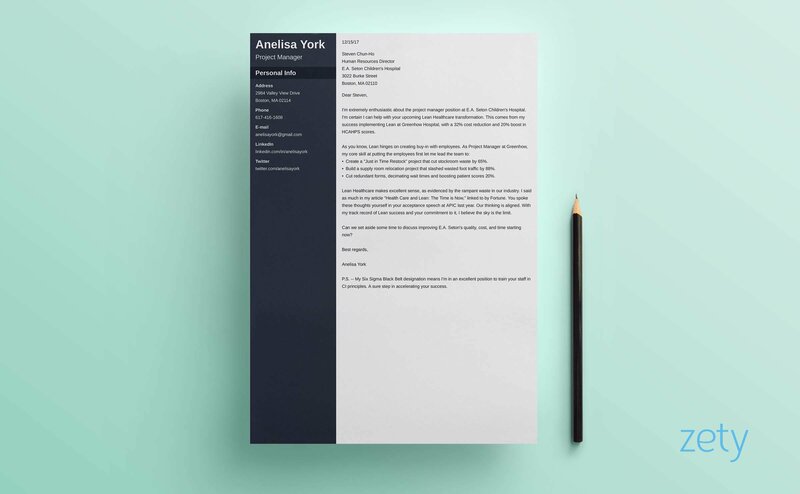 Use our cover letter templates and build your cover letter here. Perfect Length Cover Letter - See 20+ cover letter templates and create your letter here. That short cover letter is the perfect length. Now let me show you why, and what to put in it to do it right. You'll get more good cover letter examples further down. Can a cover letter be 2 pages? A cover letter should never be 2 pages. A 2-page cover letter violates the cover letter definition. Namely, a cover letter is a brief description of why you fit the job. 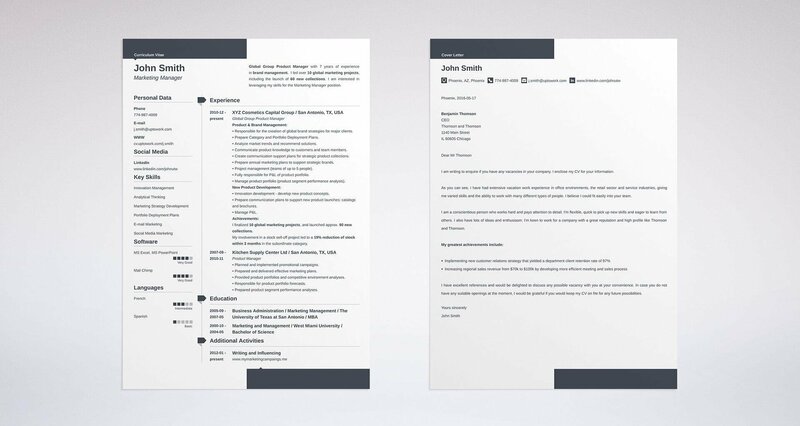 In rare cases, a resume can be two pages if you've got 10+ years experience. Should a cover letter be one page? A cover letter should always be less than one page. Short cover letters get more eye-time with managers. A cover letter that's less than a page sends an instant signal to the manager that your letter won't run over to page 2. Is my cover letter too long? A cover letter is too long if it's a full page or longer. Three page or two page cover letters are a waste of paper. A cover letter should be about three paragraphs of facts explaining why you're perfect for the job. How many words should a cover letter be? Cover letter word count should be between 250 and 300 words. Why? Because that's the right length to fill up slightly more than half a page with 12-point font. But that's not how you'll get the interview. How long should an electronic cover letter be? An electronic cover letter should be the length of cover letters on paper. Namely, three paragraphs, 250-300 words, and less than a full page. The difference is, write a great subject line and leave the address section off the top. Should a cover letter be double spaced? A cover letter should not be double spaced. Always single space a cover letter. That includes the address. The only place to double space a cover letter is in between the paragraphs. That is: insert a blank line after each paragraph ends. What about academic cover letter length? Why does the right length of cover letter matter? The right cover letter length matters because it sends a signal you're worth looking into. But how you make a cover letter the right length decides how many interviews you get. So the real question is, how do you make your cover letter the right length? You'll learn that in a minute. Pro Tip: Out of 250 applicants, only 4 will get the interview. The right length of cover letter will increase your chances exponentially. There's a big difference between a paper cover letter and an electronic cover letter. A glance at a paper cover letter tells how long it is. That makes it easier to read. An email might be two paragraphs or 50. The reader must scroll down in order to find out. That means people skim most emails. So how long should an email cover letter be? Use short sentences. Short paragraphs. Make every sentence count. I'm very excited about the software engineer position at Igatronix, Inc. I'm confident I can help you become the #1 SaaS video editing platform on the web. For one, I led the team that won the Bossie for an online video editing application. 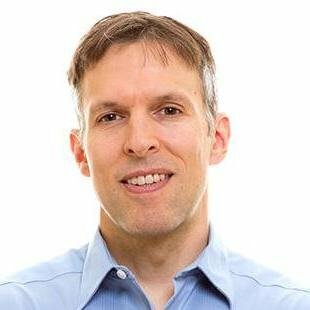 Eight years as the CEO of a profitable video production firm. Growing revenue for a SaaS business 22% through superior development. Advanced product testing, pulling in client teams to boost customer ratings 32%. I've been a huge fan of Igatronix products for several years. It's your commitment to letting employees guide the life cycle that delivers your success. You value self-motivated, highly creative software engineers, and my record speaks for itself. That short cover letter example gets the job done fast. The trick? Deliver eyebrow raising facts, lightning-fast, with zero filler. Make your bullet points as hard-hitting to the company's bottom line as possible. Pro Tip: In an email cover letter, drop the address section from the top. Make your subject line the job offer title + "applicant" + your name. Imagine you need to buy a cake. One baker sends you a long form letter about what a great cake maker he is. The other is excited. She's known you since childhood. It's your wedding cake, and she's so happy for you. Plus, she's skilled. If you create generic cover letter length by adding fluff, you're doing it wrong. Make the right length of cover letter by proving why you want this job. This example shows how long a cover letter first paragraph should be, and why. How long is a cover letter first paragraph? I'm extremely enthusiastic about the project manager position at E.A. Seton Children's Hospital. I'm certain I can help with your upcoming Lean Healthcare transformation. This comes from my success implementing Lean at Greenhow Hospital, with a 32% cost reduction and 20% boost in HCAHPS scores. See that? The manager would have to ingest something mind-altering to pass up on the interview. It's three sentences long. About 50 words. There's nothing generic about it. It shows exactly why you're fired up. It proves you genuinely care about the mission. Better still, it does it based on your experience. It's the first part to the best cover letter ever. How long is a cover letter second paragraph? Create a "Just in Time Restock" project that cut stockroom waste by 65%. Build a supply room relocation project that slashed wasted foot traffic by 88%. Cut redundant forms, decimating wait times and boosting patient scores 20%. See that? It's 50 words. It doesn't pound its chest. It doesn't say "I'm the best" like Eminem on steroids. It proves its case with numbers. It's a million miles from a generic cover letter. Think you can't do that? You can. Just read the job description carefully. Then, brainstorm about your past to find when you've delivered what it's looking for. How long is a cover letter third paragraph? Lean Healthcare makes excellent sense, as evidenced by the rampant waste in our industry. I said as much in my article "Health Care and Lean: The Time is Now," linked to by Fortune. You spoke these thoughts yourself in your acceptance speech at APIC last year. Our thinking is aligned. With my track record of Lean success and E.A. Seton Children's Hospital's commitment to it, I believe the sky's the limit. Wow. The hiring manager just stopped skimming and started reading. It doesn't just say, "I like the company." It proves it, based on your ambitions. Not sure why you like the company? Find out. Read their mission statement and "about us" page. Read news articles about them. Find out their philosophy on training and staff development. In short, dig up a reason they're the perfect company for you. Pro Tip: To get the right cover letter length, use one inch margins and 12 point font. Add white space between paragraphs to give the hiring manager's eyes a pit-stop. Also, make it single-spaced, not double-spaced. But it's the things that make it the right length that land the interview. Fluff should never add to cover letter length. Why this job, why this company, and why you. If you can do that in three sentences and you use four, your cover letter is too long. Want to know more about how long to make a cover letter? What frustrates you about cover letter length? Give us a shout in the comments! We love to help!